Thanksgiving is traditionally the time that I am able to re-connect with my boat building projects. 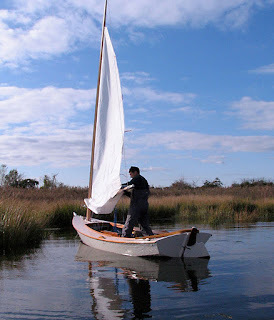 The sailing season is pretty much done, though I have not put Cricket, my crab skiff, away for the winter quite yet. I look forward to turkey day and the beginning of the holiday season, for the renewed energy and enthusiasm I always feel at the prospect of some real boat carpentry. Cricket in the marsh, tying in a reef. Photo by Chris Bickford. Mouse (as I've named the peapod) has been gathering dust for six busy months of fancy interior cabinetry, including two Manhattan kitchens since July, among other projects. I vacuumed her out and started back in where I left off. The interior had been painted, floorboards were installed, and deck beams were fitted. 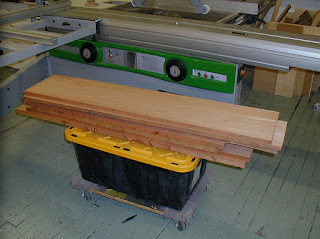 I screwed in the seat risers, and got out the spanish cedar planks that will make up the thwarts and side benches. A stack of spanish cedar will become thwarts and side benches. I made patterns for the thwarts from particle board and scrap 3mm poplar ply. 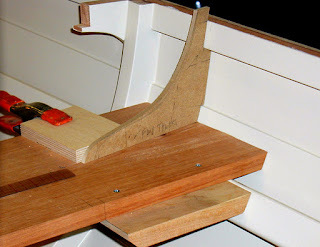 I somehow neglected to photograph this step, but the ply is fitted to the side curvature, and bevels were taken at the fore and aft edges of each thwart. I transferred the patterns to the thwart stock and sawed them out square first, then marked the bevels and sawed to the least angle on the bandsaw, then fine-tuned the bevels with a block plane on the bench. 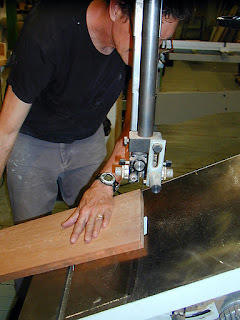 Bandsawing the bevel on a thwart. 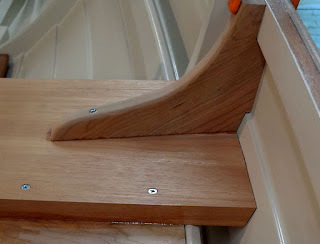 After the thwarts were fitted, I installed hardwood blocks (cherry, in this case) underneath to carry the ends of the side benches. 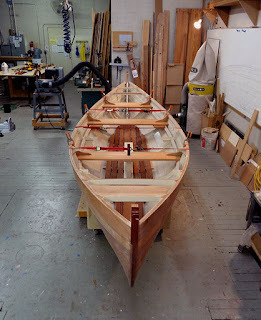 I also added an athwartship stiffener, glued and screwed to the center thwart, because the span at that location is too great to go unsupported. The stiffener is not really visible, unless you look under the seat, and that suits me fine. You'll see a lot of steel screws in these photos. These will all be replaced with bronze, and bunged, before varnishing and installing the furniture permanently. The thwarts will be held in with knees, NOT screwed to the risers. They bear against a frame on one edge, and are captured at the other by the side benches. So, the knees hold them down, and the frames and side benches locate them fore and aft. This is traditional construction. 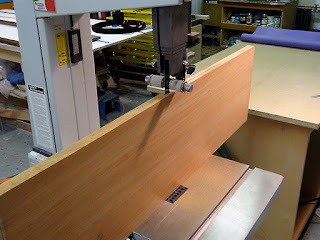 I make patterns for each seat knee from scrap mdf or ply, and fit the notches carefully before laying out and cutting the curve that makes these knees attractive. The knees themselves are cut from straight-grained cherry, with the grain running diagonally from seat to rail. Patterns are made for the thwart knees. And the knee is sawn from cherry. A boat-full of thwarts and knees. 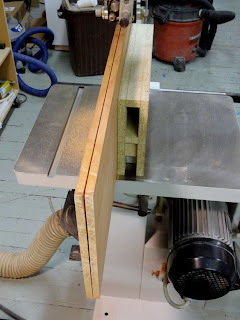 The aft knees have not been sawn to shape yet. A finished knee. The small gaps will close up when the knee is fastened in. When I planed the thwart stock to final thickness, I left the side bench stock a little thicker. I was worried about having to bend in a stiff plank to the riser's curvature. In retrospect, I probably should have spiled the risers from a wider piece, making them follow a straight line from the aft edge of the center thwart to their aft end. Walt Simmons says this should be a straight line, but I couldn't make my riser stock do anything but follow a curve similar to the sheer curve. It was all I could do to get the risers at the correct height (for rowing) at each location. So consequently, there is a bit of a dip along the span of the benches, in profile. 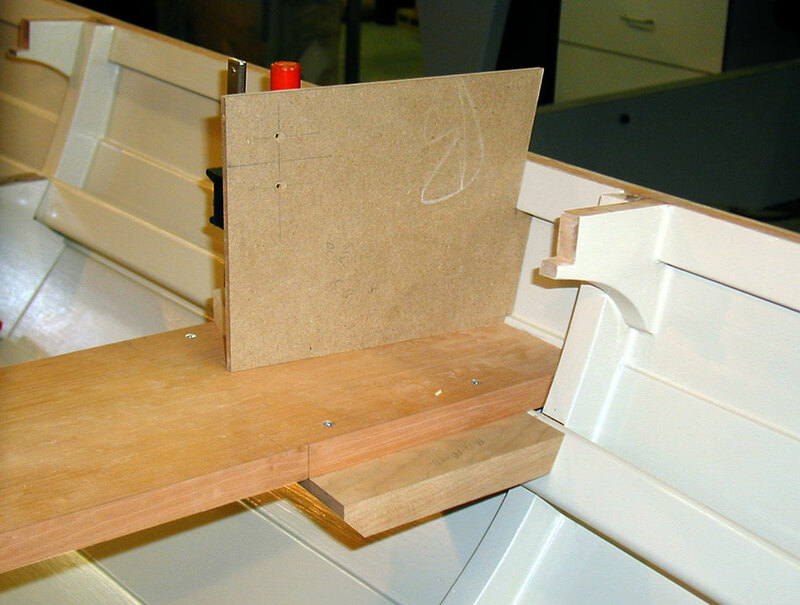 The outside curve in plan view, of course, is just sawn to shape to fit the plank's curvature. 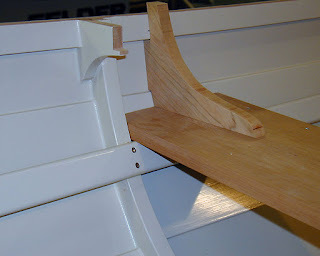 So I decided to resaw the bench stock and glue it back together with a little curve in it. I don't know if anyone else does it this way, but it makes sense to me. 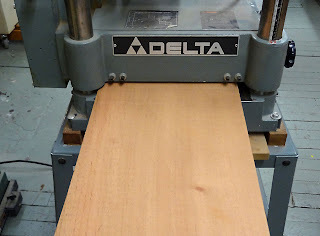 It took me about thirty minutes to resaw the stock, and run it back through the planer. 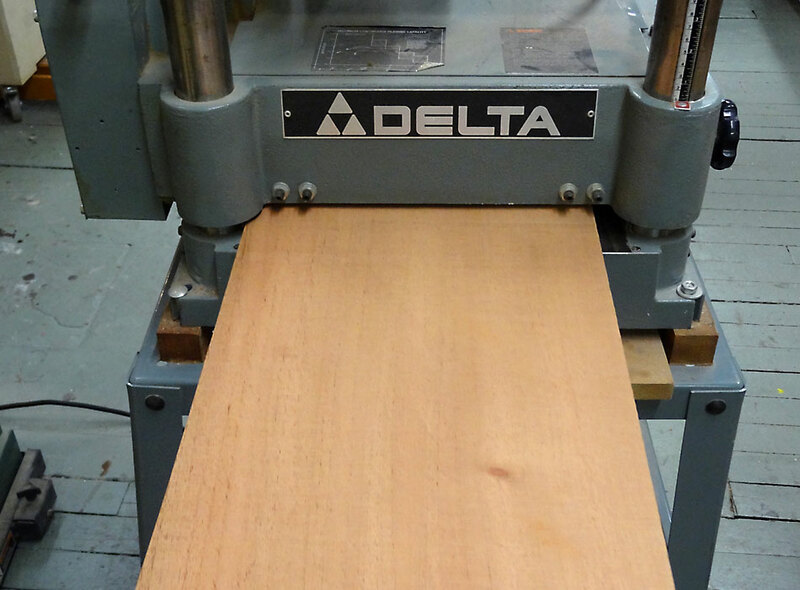 Resawing a 12" plank. 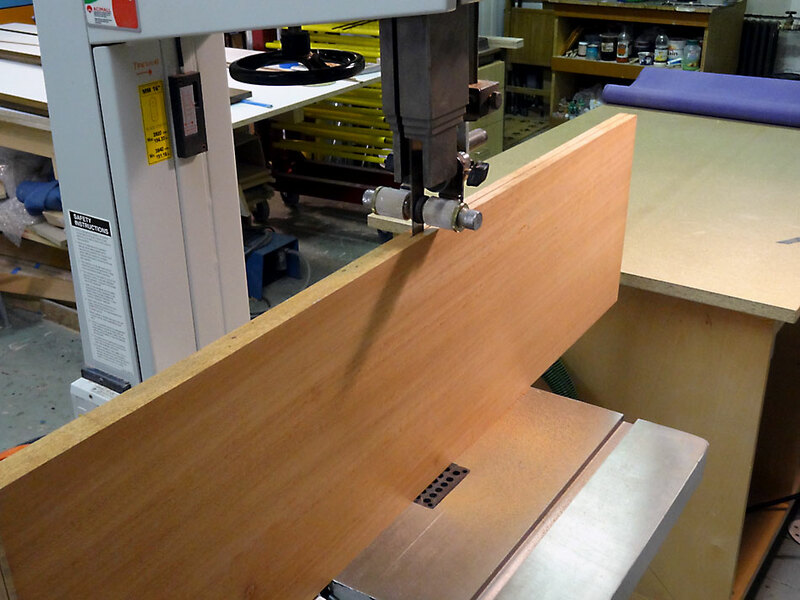 Piece of cake for this Minimax bandsaw. An extra high particle board fence is slid over the fence casting to facilitate wide resawing projects. Dressing the resawn plank to thickness. 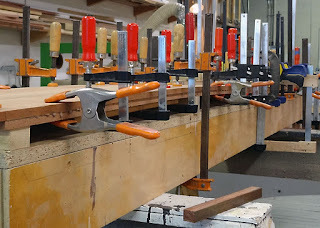 I then set up a simple form with three sticks, the middle of which was higher by the amount of curve I wanted, and glued up a bent plank for each side bench. That's where we are now, on Thanksgivng Day. 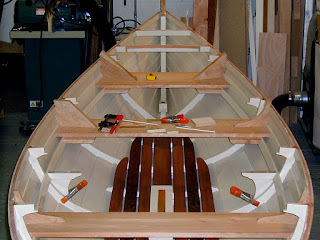 I will be fitting the side benches next, and finish up the top of the daggerboard case. 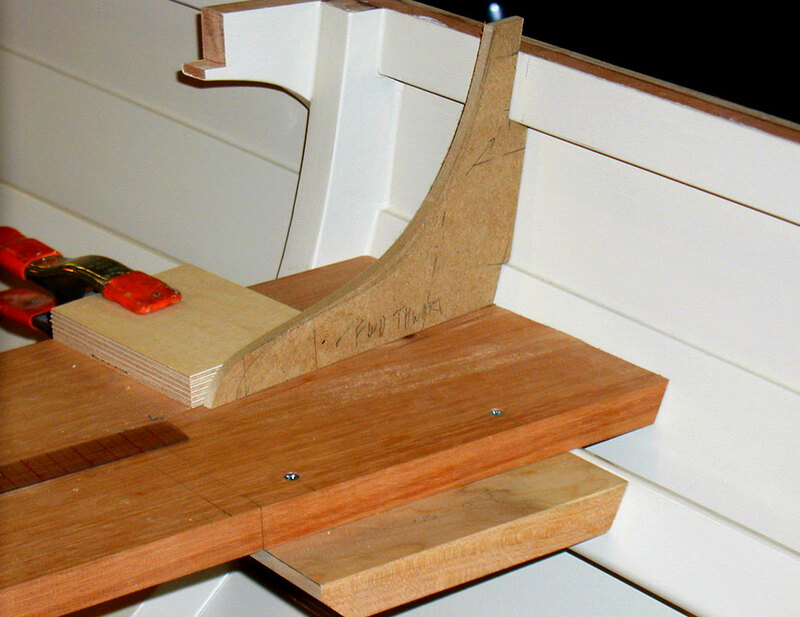 Gluing in a slight curve to the side benches.